Well the Christmas party catch ups have begun in earnest. I for one am only too happy to close the door on the Beach House and it's human contents every so often, to have a girly catch up at a wine bar with a few of the locals. Last night it was the 3BB class mums' do and I have to say it was great to get away. The lead up to a night out alone is always frantic. To get the Beach House Brats bathed, feed and pyjamaed by the time I walk over the threshold in the opposite direction, is somewhat of a miracle. I should leave it to Mr Beach House but he is no help. I know if I don't have them 'bed ready' by the time I leave, they would be still swinging from the chandeliers when I got home if it was up to him. I've a mind to accidentally on purpose forget to cook him dinner before I go out next time. Don't know why I can't leave it all up to him anyway, many do. I guess it's the control freak in me!!!! I really need to take the risk though, as I came home to a stack of dirty dishes. I must be crazy!!!! As I was getting ready, the kids were chucking bubble bath foam all around the bathroom and creating general mayhem, whilst he was swanning around in his own little world. All the while, I was trying to make myself look beautiful, which I have to tell you is not as easy as it used to be. 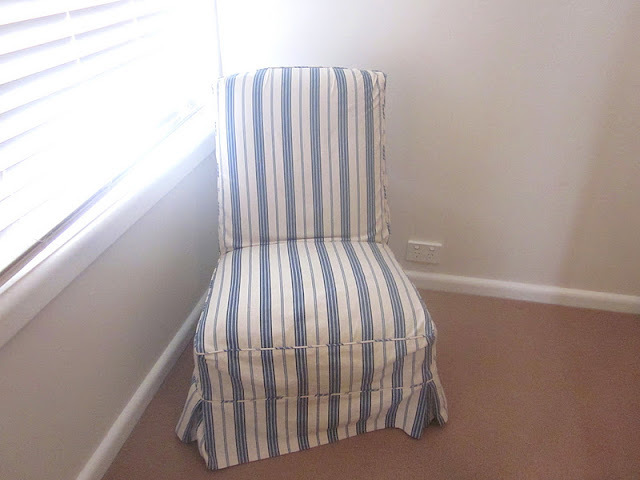 Anyway, the getting ready process very much involves this little chair in a corner of my bedroom. I like to do up my shoes here. Brush my hair and dab beautiful smelling things on my wrists and behind my ears and knees while I sit here. I once read that you should dab perfume where you expect to kissed. So as you can imagine, the areas about my person, where I dab have narrowed somewhat over the years. Anyhoo, until lately the chair has look liked this. All boring and alone. Then things started to happen. I know we are on a tight budget here at the Beach House, but how, tell me, could one go past this gorgeous silk cushion? I'll tell you, I have walked past this kinda thing copious times dear reader, but then it happened. I was skulking around the homewares aisles of K Mart and I stumbled on this gorgeous thing. 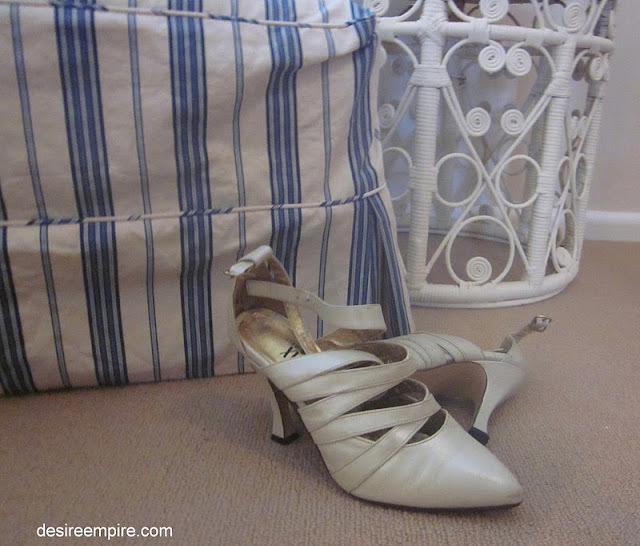 All ruffled and white and silky. They were so reasonable at $10, that I bought 2. A quick check at the local Beachy boutique revealed they were going for around $75..... The cheek of it!!!!! No wonder retail is in such trouble here in OZ. The next thing that happened was that I took delivery of this lovely little side table, once owned by a great lady, who used to fly with my mum in the 50's and 60's. She always sent me a birthday card and that continued well into my adulthood. She said it was because her son was born the day after me and she always remembered by birthday........ but just quietly I think she liked me alot too. The birthday cards are no more if you know what I mean, but I will think of her often. She also taught me how to accept a compliment graciously when I was an embarrassed pimply teenager, who had very imperfect manners at the time and I will never forget her for that either. So when I snuck into the bedroom, last night, trying not to wake the natives, I sat all alone on the chair and pondered how I might pretty up this little corner of my world. So here you have it, a beachy, coastal Frenchie little spot, where I can be all girly and alone for at least five minutes of my otherwise hectic day. I'll have to remember to shut the door though. i love that little corner & everything in it! gorgeous colour combination. well done with the k mart cushion! So pretty! I love Blue and White, it's just so calming, and your pretty slipped chair is just the right touch! What a sweet little corner to just sit and relax for a minute or two. I love your delightful pillow find too. What a terrific to call your own. 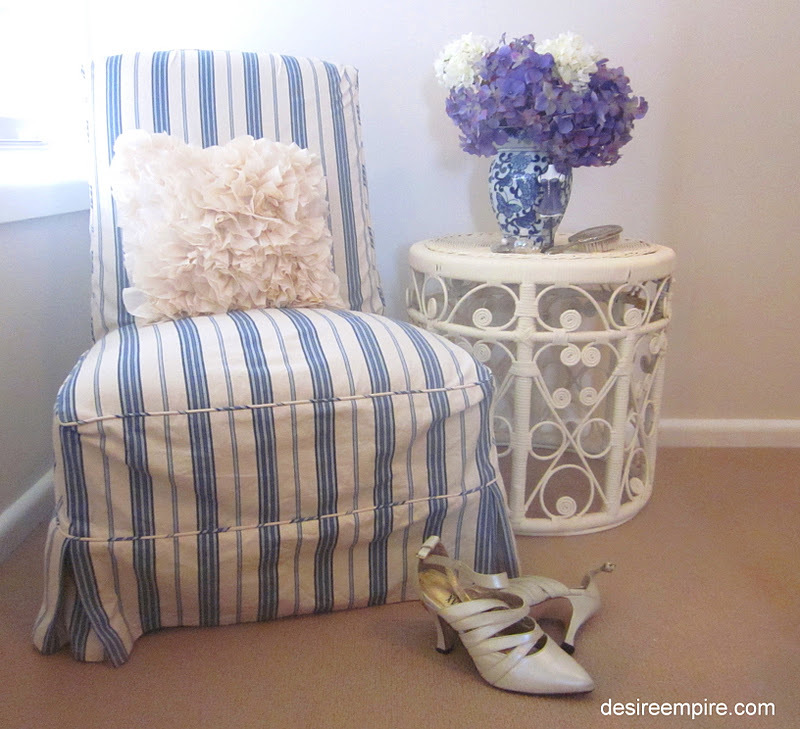 The blue chair is perfect and the vignette is so pretty with the shoes! 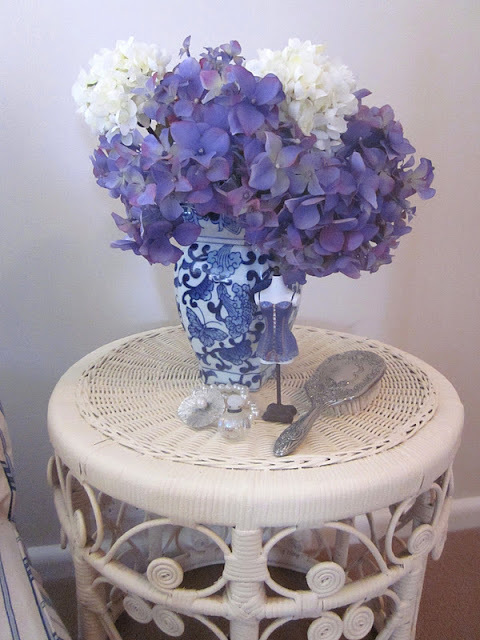 Thanks for sharing your lovely post at Potpourri Friday! Oh you have some beautiful things here love blue and white. Just new to your lovely blog and now following if you find a spare minute visit me so we can keep in touch so nice to finds new friends. Have a great day. 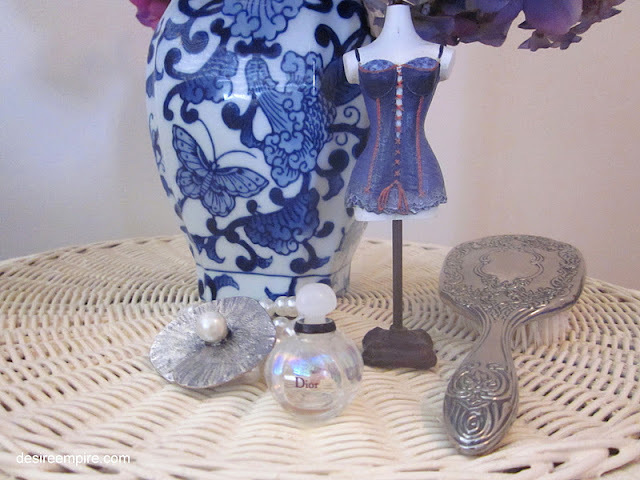 Oh how I love blue and white and yours look gorgeous! Great pillows. Hi Carolyn, What a pretty colour palette. I have given you a 'Stylish Blogger award on my blog Scrapbook for being such great inspiration in setting up my Coastal Style Blog. I love the romantic feel of it, and the pillow! Very elegant and romantic corner! Beautiful fabric on the chair! And a great pair of shoes!! Visiting from Seasonal Sunday. I love blue and white and you little corner is terrific! I am your newest follower. Sounds like you deserve a night out after what you go through to actually have a night to yourself. 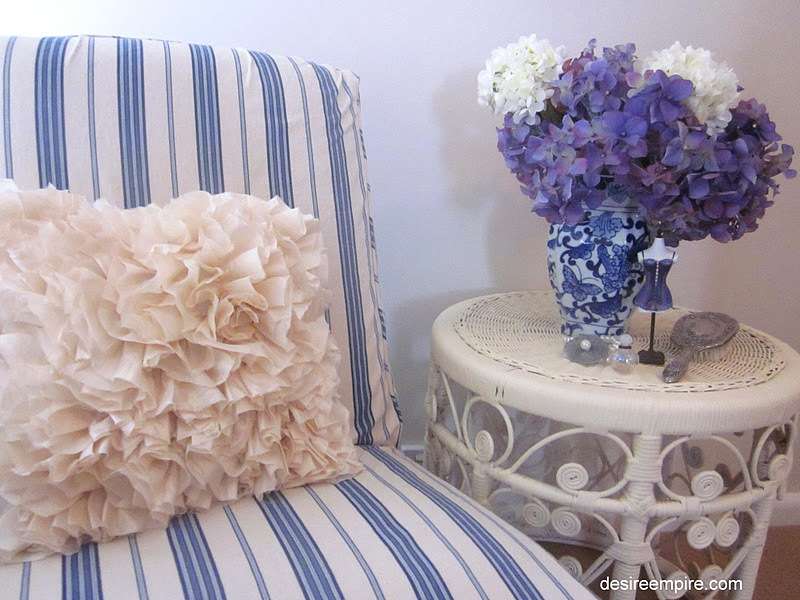 I always love blue and white together. Your chair is just darling and I love the vignette you made with it. Your cozy little corner is complete but for one thing....the glass of wine to enjoy after you've kicked your shoes off!